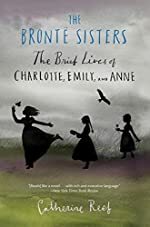 The Bronte Sisters: The Brief Lives of Charlotte, Emily and Anne by Catherine Reef. Review: Inspiring, fascinating, these are all words to describe The Bronte Sisters written by Catherine Reef. In Yorkshire, England around the 1800's, the idea of a woman writing and publishing books was absurd. Even with the limitation for women, the three Bronte sisters, Charlotte, Emily and Anne produced each of their own nineteenth century stories that are now very famous. "You know full well as I do the value of sisters' affections: There is nothing like it in this world," said Charlotte Bronte once. These words are truly inspirational to her and every young female who strives to do something that is discouraged by others. I think that these words meant a lot to her because after her mother and other sisters had died from the plague she and her sisters Emily and Anne had lost hope in writing. After years struggling with boarding schools and illness's they knew that their loved ones would not want to give up on their dreams just because of a few unfortunate events. Even though personally I was not fond of this book I have to admit that it is a very inspiring story. I would give The Bronte Sisters 3 stars because it is a good story and I admire all of the Bronte sisters but it did not necessarily fit into my preferred book genre. I recommend The Bronte Sisters to anyone that just jumps into a historical nonfiction book or an aspiring writer with big dreams but small chances. Review written by Lauren (th grade student). We would like to thank Houghton Mifflin Harcourt for providing a copy of The Bronte Sisters: The Brief Lives of Charlotte, Emily and Anne for this review. Have you read The Bronte Sisters: The Brief Lives of Charlotte, Emily and Anne? How would you rate it?